Admiring Pretty Things: Anna French Has it! Even if just in a tiny space, I would love a little Anna French for extra cheer. 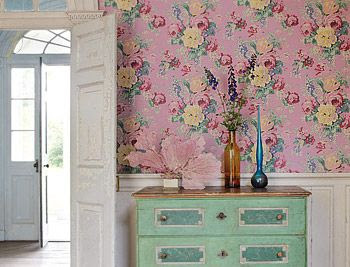 How crazy gorgeous is this wallpaper?!!!!!! 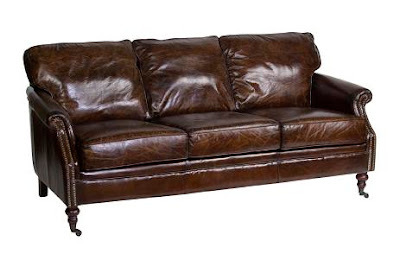 I am imagining it against a white backdrop, floors and all and with this luscious leather sofa I am currently coveting. W has convinced me I cannot have white anymore, but what about this baby? Would even look better with age! hi! I've seen that paper in person, GORGEOUS!!!! Are u home yet? I have this sofa or it's twin. It is wonderful...looks better the more worn it gets and spills wipe right off. I adore it...did you hear me? I said adore! Go for it...you won't be sorry.